The Jerusalem embassy move is another crude, angry Trump gesture against the political correctness of the elites. 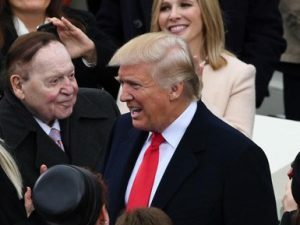 It has the added plus for Trump of paying off campaign contributor Sheldon Adelson and the evangelical Mike Pence constituency driven by Millennial visions of the second coming. It’s doubly anti-PC because it is based on a cynical calculation that the fairly predictable cost in Palestinian lives should not be a disincentive to making a gesture of America First and a rejection the global foreign policy establishment. Support for the Palestinian cause ranks high in the lefty universe that Trump loves to bash. It’s a core belief of most Democrats (except for those in the pocket of AIPAC), a galvanizing issue on many campuses, and an issue from which the US departs from most European and global allies. All the better that those globalist America haters at the UN can never seem to stop making futile gestures in support of Palestinian rights. And of course the media largely falls in line with a pro-Palestinian narrative. It’s hard not to be sympathetic to a people who are living in a military police state in the West Bank, and in an open air prison in Gaza. Yet at the same time, there is a tendency in the press to conveniently avoid focusing on the corrupt, darker side of the Palestinian situation. Here I’m not talking about terrorism or fundamentalism or Palestinian rejectionsim, but rather the status of the Palestinian Authority as a large and profoundly corrupt welfare state, now led by a senile autocrat who recently embarrassed himself by a rambling discussion of pet anti-semitic theories he had embraced as a graduate student. I point this out now because it is the underlying myopia, the looking the other way, of the left-wing, politically correct Jewish Voice for Peace point of view that creates an odor of vulnerability that encourages Trump to pounce and devour. Trump is an evil Groucho Marx. The rest of the world a shocked Margaret Dumont. Yes, it’s largely a ceremonious fiction to maintain the US embassy, and almost every other embassy, in Tel Aviv. It’s phony, a sop to hopefulness, moral posturing, political correctness. On the other hand, gestures that undermine the chance for a two-state solution undermine the real long-term interest of both Israel and the US. In that light, moving the embassy is a nihilistic finger in the eye gesture. It’s trendy to declare the two-state solution dead, but unfortunately there is no other solution. Giving up the Jerusalem card no doubt emboldens the Israeli right, and will no doubt fuel further settlement expansion and appropriation of property in East Jerusalem. And finally, there are the hundreds of Palestinians who have been and will be killed because of the embassy provocation. Regardless of the politics of the situation, there is the human calculus that rightly judges the value of the embassy decision by its cost in lives. It’s a provocation that has prompted acts of suicidal desperation in Gaza. It may prompt further acts of suicidal desperation in the West Bank as well, and will no doubt cost some smaller number of Israelis — and even American — victims. And even in a place that is often called complex, where history makes argumentation futile and endless, an America First reality show stunt is not worth the shedding of blood.